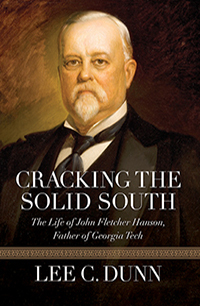 John Fletcher Hanson was a rare combination of industrialist, journalist, and orator who spent most of his life in Macon, Georgia, rising from the ashes of the Civil War to become the leading voice of the New South. Many have assigned that role to Henry Grady, but while Grady was talking about a New South, Hanson was building one, by creating jobs, promoting Southern industrialization, and advancing educational opportunities. Hanson, commonly referred to as “the Major” throughout his lifetime, founded Bibb Manufacturing and grew it into a textile empire, which stands beside his most enduring legacy, the Georgia Institute of Technology. Later, as president of the Central of Georgia Railway and the Ocean Steamship Company, he strengthened the backbone of the state’s transportation network. During the 1880s Hanson owned the Macon Telegraph and used it to challenge conventional Southern ideology about economics, race, and the solid Democratic stronghold on the South. While also fighting for a pro-business platform, he became a Republican and worked with some of the most influential men of the Gilded Age. Georgia’s post–Civil War history cannot be fully understood without examining the life of J. F. Hanson, its most important New South advocate and industrialist. In bringing this remarkable man and his accomplishments to light for the first time, CRACKING THE SOLID SOUTH paints an absorbing picture of the economic, political, and social struggles that confronted Georgia after the Civil War and of the many ways one man shaped the course of the state’s history. Author Lee Dunn’s fascinating biography of John Fletcher Hanson resurrects the important story of the contributions of a Georgian that deserves to be better known. Not only was he one of the major crusaders for the founding of the Georgia Institute of Technology, he also impacted the state and its future as a leading industrialist, newspaper publisher, and visionary. His progressive ideas on race, politics, economics, and nationalism put him at odds with most of the leaders of his time, but he courageously advocated and worked for a modern Georgia. This biography should restore Hanson to his rightful place in the saga of our state. Though generally known as "the Major" for his service to the Confederate Army, John Fletcher Hanson's greatest commitment was to the New South, not the Old. Sometimes overshadowed or outmaneuvered by his journalistic rival Henry Grady, Hanson's relentlessly scientific approach to industrialization and his willingness to work with organized labor in order to improve both industrial productivity and working conditions make him arguably as important as Grady to scholars of the New South. Likewise, Hanson's support for "welfare capitalism" (long before the term itself was coined) and his advocacy of a functioning two-party system in Georgia both mark him as a man well ahead of his time. John Fletcher Hanson is hardly a household name, but Lee Dunn's meticulously researched and engagingly narrated book will help change that. Best known for his work in establishing the Georgia Institute of Technology, Hanson was somewhat of a nineteenth-century Renaissance man of the South whose interests spanned from journalism to industry to politics. Dunn's history of his life and times is the best kind of history—locally focused but with meaning that resonates far beyond.